Question: Is it possible to see who the service contacts are in a case before I efile? This would be handy to know when I'm preparing my certificate of service. Search the eFileTexas Public Service Contact List for counsel that does not display on the Service Contact list for the specific case (counsel may not be on the service contact list but you can add him/her through the Public Service Contact List if found there). Click the Case button (Figure 1, A) on the sub-navigation bar. On the List of Cases page select, or search for, the jurisdiction for the case. Enter the case number in the required field. When the case is found click the + in the far left column so it becomes a - (Figure 2, A). The case tabs open below the listing of the case. Click the Case Service Contacts tab (Figure 2, B) and view the list of service contacts for this case (Figure 2, C). If there are many service contacts you have navigation features at the bottom of the list to show more service contacts. Click the eServices button on the sub-navigation bar (Figure 3, A). Click eServices Search on the drop-down menu (Figure 3, B). 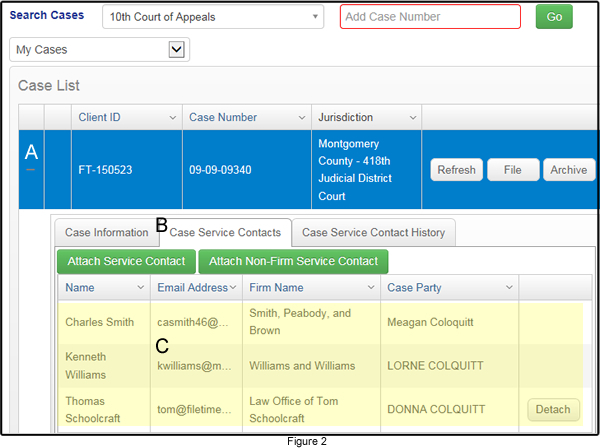 Search for counsel’s name on the Search Service Contacts page (Figure 4, A). If you find counsel’s name (Figure 4, B) you will be able to add/him her to your eService Recipients list when you submit an eFiling for the case.